There are some great new product ranges that have been added to VioVet this month. For dog owners we have added a selection of grooming and care products from Petkin. Cat owners have the opportunity to provide their cat with some tasty new dry food diets from thrive. NAF have recently released four great grooming products that are sure to please horse owners. We also have a new cage cleaner and disinfectant from Bob Martin to help those with their small house pets. Last but not least we have riders clothing for juniors and children from the Harry Hall brand. Petkin are an American company who have been creating pet products since 1988, and have come a long way from where they started. 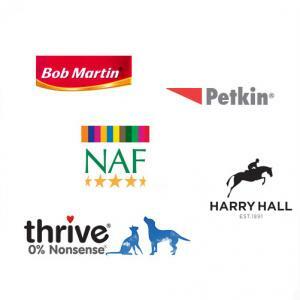 All the products in the Petkin range have been developed with the same ideas in mind. They are all safe, effective and easy to use for all owners. They have created a wide range of products for both dogs and cats many of which you can now source directly from VioVet. Their grooming products include Daily Cleaning Wipes to help clean the coat and reduce odours, Itch Stop Wipes to help cool and soothe irritating spots of your pet's skin, Ear Wipes to help remove wax, dirt and discharge, and Face & Body Wipes which provide a more gentle application to use on their face. Other care products also available now are Dental Food Spray to help clean the mouth and freshen breath, and Dental Toy Spray which can be sprayed on their favourite toy to clean their mouth without any effort. thrive is a pet food company which has been producing food and treats for cats and dogs for over 10 years. The difference between thrive and many others is what they put into the food. The quality can be seen by the small list of ingredients on every packet; there are no confusing long lists of extras thrown in like many other treats and meals. This month has seen their range expand with thrive PremiumPlus cat food and comes in Chicken & Turkey flavour which includes 90% meat content, or Salmon & Herring which includes 70% fish. With a range of elements also added because of their health benefits, you can see that thrive PremiumPlus cat food is sure to become a winner with your cat. NAF have long been a household name when it comes to equine supplements, however this is not the only reason why they are so popular. Their skin care and grooming products are a result of having over 25 years of equine product experience so no wonder they are so popular. This makes it all the more exciting when they release new ranges as we know our customers will love them. Their Fab Four collection consists of two shampoos, a grooming spray and a stain remover. Show Off provides a deeper clean and brighter shine for your horse, while Pimp my Pony helps to clean as well as make the subject stand out from the crowd. Shine On spray silks up manes and tails, giving your horse the perfect finish, and Muck Off ensures to keep your horse spotless with little effort. If your small pet spends most of their time in their cage then it is bound to require a little clean every now and them. We now have My Little Friend Cage Disinfectant from Bob Martin available to order so you can keep your small pet's living environment germ, virus and bacteria free. This safe and easy to use spray can be used all over their cage as well as on their equipment too. This mild disinfectant can be used to regularly keep their cage clean and fresh. Harry Hall are an established clothing, leisurewear and riding gear producer for the stylish and fashionable rider. Luckily you can now source their items directly from VioVet, with more of their range to be added in the near future so keep checking back for more. To start this month you can feast your eyes on their Mappleton Polo Shirt and Chester Sticky Bum Jodhpurs for junior riders. Great for keeping the up and coming rider stylish and comfortable.